Motorcycles first started racing along Mary street when Mary and Hill street were the only streets on the Halls Head side of the inlet. Motorcycles and sidecars raced on Marl, which was a combination of limestone and seashell. Doug Whitehead was one of those young men that believed if it was a motorcycle or had a motorcycle engine fitted to it, it should be raced. Doug was just like many others in his young day, even racing boats at the Crawley Baths and Mandurah etc. 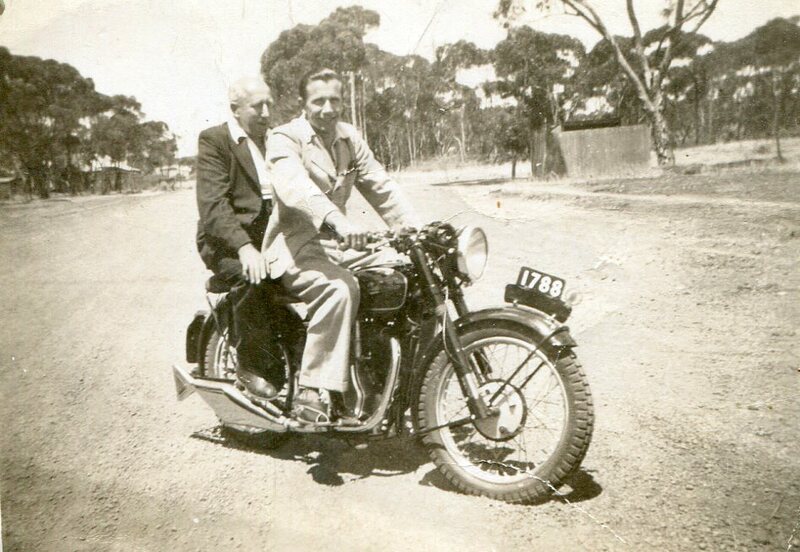 1948 - Above an early pic of Doug and his dad on Doug's Velocette. Photo: Nola Whitehead. 1957 - Right Doug Whitehead sitting in his car after his well earnt second placing in an event on the streets of Halls Head Mandurah. Photo: Nola Whitehead. Due to some locals objecting to the racing on the streets a purpose built clay track was built in Suttons paddock between the coast road and the estuary, the track ran through the swamps and in and around tree's. These race days became very popular as the track was right in town at the foot of the Mandurah bridge on the south side were the Port Mandurah Canals are now. The Police boys club were involved in the race day activities as a way to raise money for their local club. they collected entrance fee's and set up stalls selling cool drinks and food to those who attended. 1920's - Suttons paddock is located over the bridge and on the left in the cleared area Photo: Unknown. 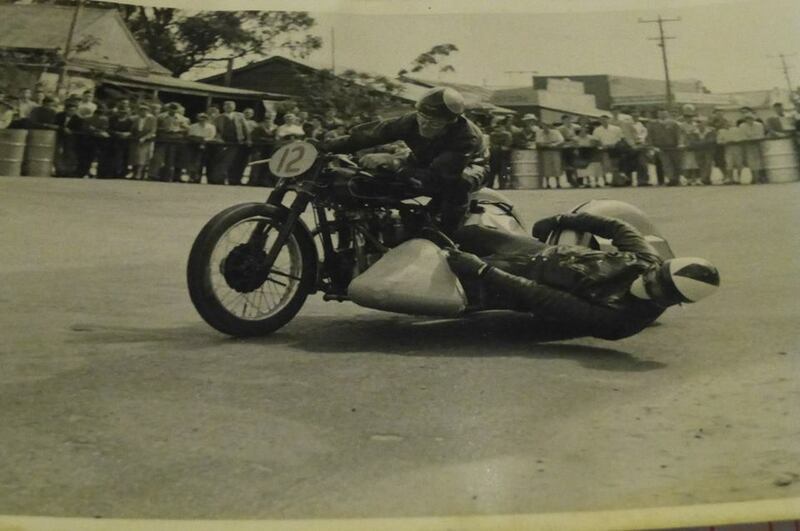 1956 - Bryan Ralston & Des Phillips in a sidecar event around the streets of Madurah Photo: Megan Ford. In 1956 the Perth tq Car Club had teamed up with the Coastal Motor Cycle Club to run the around the houses racing, with this tq race cars were introduced to the race meeting. 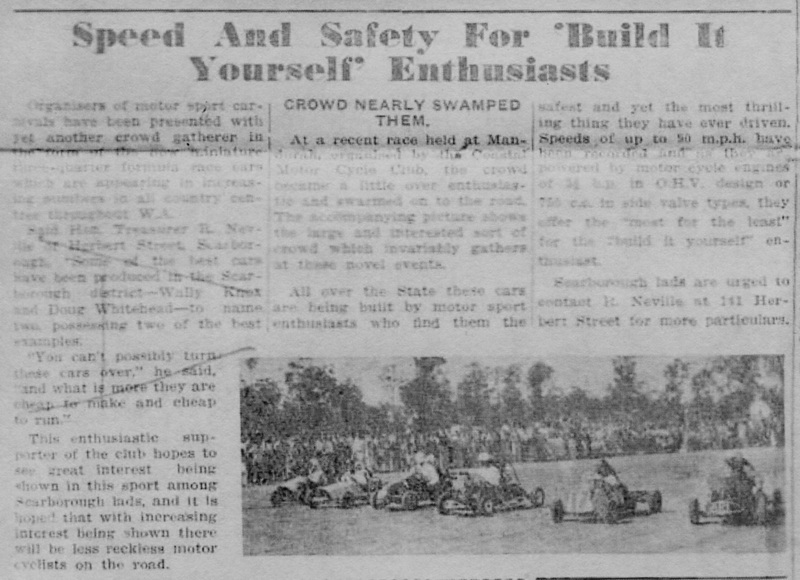 The Perth Tq Car Club held there very first Tq race meeting around a street circuit on the 10th of November 1957 when the club combined with the Coastal Motorcycle Club to stage the annual around the houses event for Mandurah. This meeting was more of a demonstration run for this new class of racing, Seven cars started the meeting with Wally Higgs from the Perth Tq Car Club running a Gold Star BSA and Doug Whitehead also from the Perth Tq Car Club and running a BSA. 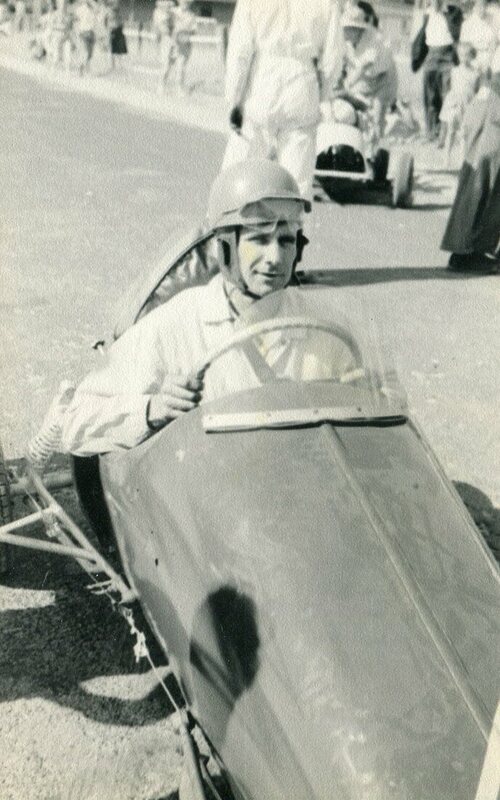 Other Perth racers in attendance were Wally Knox, George Higgs and Bunny Burrows, Country drivers in Ted Scott with a Triumph twin machine from Albany and Harley Pederick also with a Triumph twin from Wagin. As in anything new, a few drivers experienced various mechanical problems on the day, which resulted in only four drivers finishing with the two most experienced drivers in Wally Higgs and Doug Whitehead finishing first and second. The Coastal Motor Cycle Club held the annual Mandurah around the houses event in 1959.